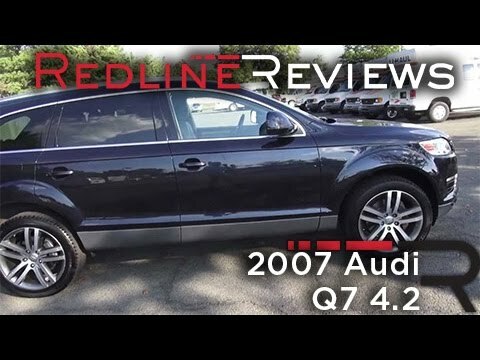 The q7 is a great family vehicle! My Q7 is very comfortable for myself and my four young kids. The car is very reliable and is a smooth ride. Our stroller is a tight fit when folded up in the back when the third row seats are in use, but manageable. We can fit three car seats across the second row seating. The sun roof is great in the summer and can still open when we have a thule box on the roof. This Audi is family friendly. My Audi q7 is very safe and reliable. I have four children that fit comfortably and have space for three car seats across the middle row. I love the heated front seats in the winter and the ability to lower the third row seating when needed. There is even room for our jogging stroller in the back. It has automatic side doors. Like the size, style, and driving performance. Dislike the problems with the sunroof lines water leaking into vehicle, causing the whole electronics in car to not work.